Where my real food journey began, on a farm! 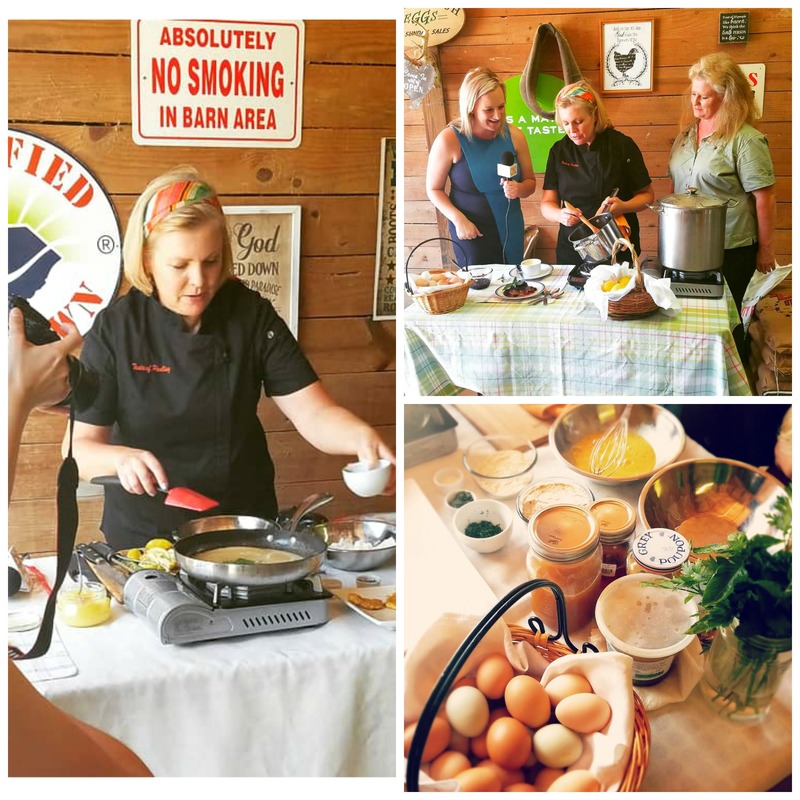 This past week I was thrilled to make a trip out to one of my favorite farms, Thames Farm in Lancaster, SC, to film cooking segments for the CN2 Today Show. Born and raised on a farm in South Africa, farmers who are striving to raise food, the way food should be raised, have a special place in my heart. To be farmer truly is a labor of love, at mercy of the elements and mass factory farming squeezing the bottom line. One only has to look at the epidemic of autoimmune conditions in the USA, the connection to the source is obvious, most of our food is factory farm raised with a plethora of antibiotics, hormones and pesticides; the result…. a chemical laden product short changed on nutrients from the get go! 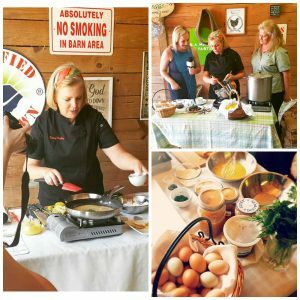 Watch me on camera in this segment, cooking with Farmer Amy’s free rage chicken and eggs. The divine bright orange color of the eggs and sublime taste of the chicken comes from chickens that are pasture raised, feasting daily on a buffet of bugs with plenty of fresh air and sunshine! Coming up on September 8th, I will be preparing these recipes live at Farm Day, come on out to taste the amazing product, bring your family to see how food should be raised, an support your local farmer! 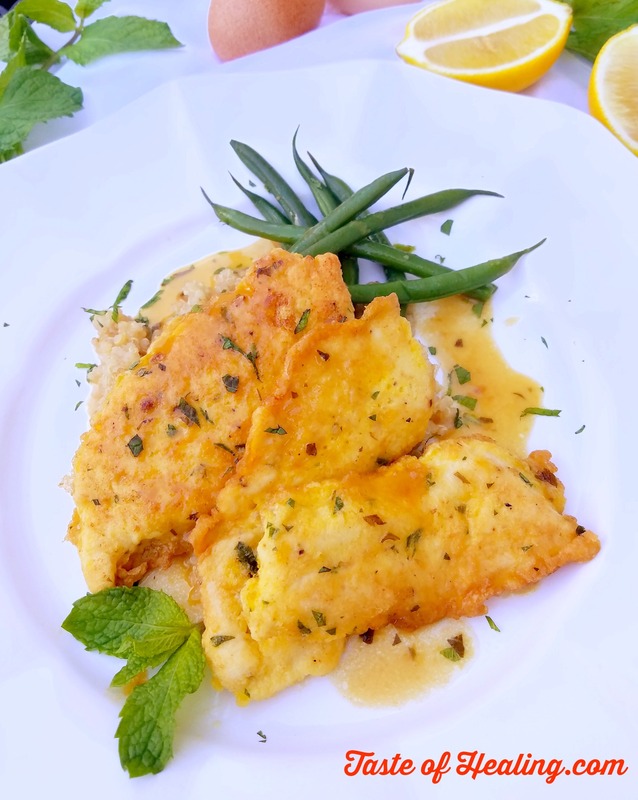 A new spin to dinner with a reverse breaded technique yielding delicate cutlets, with lemon, honey and a hint of mint. ¼ cup coconut oil, as needed, for cooking. 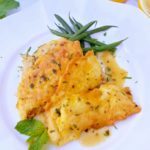 Cut Chicken breasts on the bias 1″ apart, place on a cutting board, cover with a large heavy-duty plastic bag and pound out gently with a mallet. In a separate bowl beat together eggs, water, ½ tsp sea salt, mint, parsley, and 1 tsp of lemon zest. Squeeze the lemons and set aside. Place a large plate or baking sheet in a warmer or low oven. Heat a pan over medium high heat and add approximately 2 tsp coconut oil to coat the pan. Working in batches, quickly dip the chicken breasts first in the flour, then the egg wash, and fry until golden, approximately 1 minute per side. Remove to serving plate to keep warm, heat more oil and continue until all chicken is done. Turn heat up and add the lemon juice to pan, reduce by half. Add the broth, mustard and honey, simmer a few minutes longer. Beat in the butter a knob at a time until emulsified. Spoon sauce over chicken pieces, serve with quinoa, mashed potato or rice and green salad.